MK Dons eased into the second round of the Carling Cup with a comfortable win at Cheltenham. The hosts took the lead when Luke Summerfield's shot from the edge of the box deflected past David Martin. But the Dons equalised when Sam Baldock converted Angelo Balanta's pass from six yards before Jabo Ibehre fired them ahead from 12 yards. Dean Lewington headed in the third from Balanta's corner, with the Colombian nodding in Ibehre's cross to seal it. "When you play decent teams that's what happens sometimes. "We had them by the throat and we didn't score a couple of goals we should have scored and the equaliser deflated us. "For large periods of the game we more than matched them but we got taught a lesson in how to be clinical." "When the boys went in to overdrive they were different class. "That's the frustrating but the good thing, as I know they got it but I want to see it more. "Tonight just showed the strengths and weaknesses of us, how good we can be and how bad we can be, and yet we've come away with a 4-1 result." 90:00+2:08 Russell Penn has an effort at goal from outside the box missing to the wide left of the goal. 89:49 Kaid Mohamed produces a right-footed shot from deep inside the penalty box which goes wide of the right-hand upright. 87:51 Free kick crossed left-footed by Shaun Williams from right channel, Steve Elliott manages to make a clearance. 87:51 Booking Danny Andrew goes into the book for unsporting behaviour. 87:47 Unfair challenge on Luke Chadwick by Danny Andrew results in a free kick. 86:52 Effort on goal by Brian Smikle from inside the area goes harmlessly over the bar. 86:24 Unfair challenge on Alan Bennett by Sam Baldock results in a free kick. Danny Andrew takes the free kick. 85:37 Sam Baldock has an effort at goal from just outside the box which goes wide of the right-hand post. 84:00 Foul by Dean Bowditch on Alan Bennett, free kick awarded. Keith Lowe restarts play with the free kick. 83:16 Substitution James Spencer goes off and Darryl Duffy comes on. 82:49 The ball is sent over by Keith Lowe, Shot from close range by Kaid Mohamed misses to the right of the target. 82:22 Kaid Mohamed takes a shot. Save by David Martin. 80:58 The offside flag is raised against Russell Penn. Free kick taken by Dean Lewington. 80:02 Sam Baldock takes a shot. Save by Scott P Brown. Corner taken right-footed by Sam Baldock from the right by-line, Marlon Pack makes a clearance. 78:28 Adam Chicksen produces a left-footed shot from just outside the box that goes wide right of the target. 76:44 Luke Chadwick handles the ball and concedes a free kick. Scott P Brown restarts play with the free kick. 69:39 James Spencer produces a right-footed shot from the edge of the box and misses to the right of the target. 68:16 Marlon Pack restarts play with the free kick. 68:16 Booking Luke Chadwick goes into the book. 67:52 Free kick awarded for a foul by Luke Chadwick on Luke Summerfield. 66:02 Substitution Jeff Goulding goes off and Brian Smikle comes on. 66:02 Substitution Russell Penn on for Joshua Low. 66:02 Substitution Daniel Powell on for Angelo Balanta. 66:02 Substitution Jay O'Shea replaces Jabo Ibehre. 65:10 Angelo Balanta concedes a free kick for a foul on Kaid Mohamed. A cross is delivered by Danny Andrew, Headed effort from inside the box by Alan Bennett misses to the right of the target. 63:26 The assist for the goal came from Jabo Ibehre. 63:26 GOAL - Angelo Balanta:Cheltenham 1 - 4 MK Dons Angelo Balanta finds the net with a headed goal from close range. 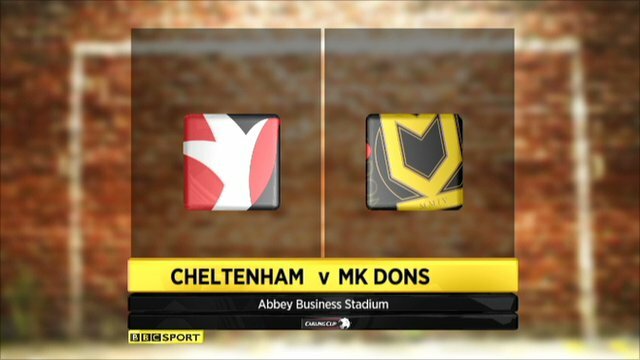 Cheltenham 1-4 Milton Keynes Dons. 62:05 Substitution Darren Potter leaves the field to be replaced by Luke Chadwick. 60:52 Assist by Angelo Balanta. 60:52 GOAL - Dean Lewington:Cheltenham 1 - 3 MK Dons Dean Lewington scores a headed goal from close range. Cheltenham 1-3 Milton Keynes Dons. 59:24 Free kick awarded for a foul by Shaun Williams on James Spencer. Luke Summerfield takes the free kick. 58:39 Angelo Balanta takes a shot. Save by Scott P Brown. 56:17 Sam Baldock is caught offside. Scott P Brown restarts play with the free kick. 52:58 Keith Lowe delivers the ball, clearance made by Adam Chicksen. 51:44 The ball is delivered by Danny Andrew. 49:41 Sam Baldock challenges Steve Elliott unfairly and gives away a free kick. Free kick taken by Scott P Brown. 48:41 Angelo Balanta has an effort at goal from outside the box missing to the wide left of the goal. 47:15 Free kick awarded for a foul by Danny Andrew on Angelo Balanta. Direct free kick taken by Angelo Balanta. Correction - 45:23 Assist on the goal came from Sam Baldock. 45:23 Assist on the goal came from Dean Bowditch. 45:23 GOAL - Jabo Ibehre:Cheltenham 1 - 2 MK Dons Jabo Ibehre grabs a goal from inside the penalty area to the bottom right corner of the goal. Cheltenham 1-2 Milton Keynes Dons. 45:00+1:04 The ref blows to end the first period. 44:38 James Spencer concedes a free kick for a foul on Shaun Williams. Shaun Williams restarts play with the free kick. 43:09 The referee blows for offside. Indirect free kick taken by Scott P Brown. 42:24 Angelo Balanta crosses the ball. 40:36 Assist by Angelo Balanta. 40:36 GOAL - Sam Baldock:Cheltenham 1 - 1 MK Dons Sam Baldock fires in a goal from close in low into the middle of the goal. Cheltenham 1-1 Milton Keynes Dons. 40:06 Angelo Balanta takes a shot. Save by Scott P Brown. 38:47 James Spencer takes a shot. David Martin makes a save. 37:50 Outswinging corner taken right-footed by Marlon Pack from the right by-line, clearance by Jabo Ibehre. 37:34 Marlon Pack takes the chance to get an effort at goal. Save by David Martin. 36:34 James Spencer takes a shot. Save by David Martin. 35:52 Jabo Ibehre takes a shot. Keith Lowe gets a block in. 35:11 Joshua Low sends in a cross. 34:50 Dean Bowditch sends in a cross, clearance made by Keith Lowe. 33:26 Free kick awarded for a foul by Adam Chicksen on Kaid Mohamed. Shot on goal comes in from Marlon Pack from the free kick. 31:03 Adam Chicksen has an effort at goal from outside the box which goes wide left of the target. 29:52 Dean Lewington challenges James Spencer unfairly and gives away a free kick. Keith Lowe restarts play with the free kick. 28:09 GOAL - Luke Summerfield:Cheltenham 1 - 0 MK Dons A goal is scored by Luke Summerfield from outside the box to the bottom left corner of the goal. Cheltenham 1-0 Milton Keynes Dons. 26:11 Corner from left by-line taken by Angelo Balanta. 24:34 Inswinging corner taken right-footed by Angelo Balanta from the left by-line, Darren Potter takes a shot from just inside the penalty box which clears the crossbar. 24:21 Dean Bowditch takes a shot. Save by Scott P Brown. 21:47 Unfair challenge on Dean Bowditch by Danny Andrew results in a free kick. Free kick crossed left-footed by Shaun Williams, clearance by Keith Lowe. 20:48 Unfair challenge on Marlon Pack by Jabo Ibehre results in a free kick. Direct free kick taken by Steve Elliott. 19:18 Free kick awarded for an unfair challenge on Alan Bennett by Sam Baldock. Scott P Brown restarts play with the free kick. 18:04 The ball is delivered by Keith Lowe. 17:18 Sam Baldock has an effort from just inside the box that misses to the left of the target. 11:08 Outswinging corner taken by Danny Andrew. 11:00 Kaid Mohamed delivers the ball, clearance by Dean Lewington. 10:39 Centre by Dean Lewington, Steve Elliott manages to make a clearance. 9:02 Kaid Mohamed takes a shot. Save by David Martin. 8:20 Shot from outside the area by Darren Potter misses to the left of the goal. 7:34 Stephen Gleeson challenges Luke Summerfield unfairly and gives away a free kick. Direct free kick taken by Marlon Pack. 6:59 Stephen Gleeson has an effort at goal from outside the box which goes wide right of the goal. 5:30 Unfair challenge on Luke Summerfield by Stephen Gleeson results in a free kick. Keith Lowe takes the direct free kick. 4:33 The ball is sent over by Adam Chicksen, Danny Andrew makes a clearance. 2:48 Dean Lewington sends in a cross. 1:14 Stephen Gleeson takes a shot. Save made by Scott P Brown. 0:29 Foul by James Spencer on Gary MacKenzie, free kick awarded. Direct free kick taken by Shaun Williams.